4 day cancellation policy prior to arrival. Failure to cancel within 4 days prior to arrival will result in payment being charged for the first night&#39;s stay. Any damages to the property resulting from group activities must be paid for by the group prior to check out. The Dream Kasbah property is located a short walking distance from the famous Place Jemaa El Fna, tourist attractions and local Souks. The property itself is situated in the Old Kasbah, a local area that is fairly new to tourism but historic with the original city gates and walls of the Medina. The Kasbah is a small oasis of peace and tranquility featuring traditional Moroccan décor with an Eco focus. 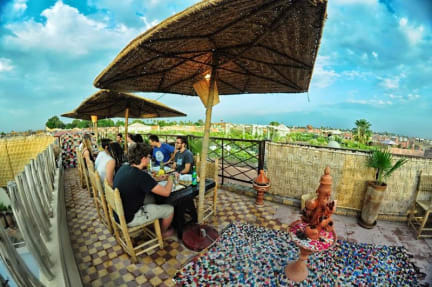 The terrace is perfect for sunset viewing and ideal for enjoying lunch or dinner comprising home cooked Moroccan specialties. The terrace view captures the two largest Mosques in Marrakech and also looks across to the snow capped Atlas Mountains. Dream Kasbah prides itself on having a unique relationship between staff and guests, connecting with clients on a personal level we offer travelers a home away from home. 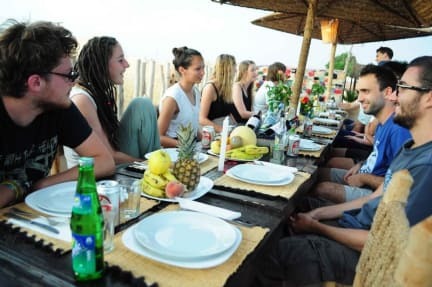 We provide all the typical services of a backpackers or B&B, but with unique Moroccan hospitality. The place is very well located and the staff is awesome! Special thanks to Said and his positivity!! Foi muito bom! Estrutura incrível! Funcionários maravilhosos! Destaque especial pro Muha, meu novo amigo! Espero poder voltar pra jogar mais Vassas!! Excelente hostel! Staff super legal e excelente terraço. I liked very much. The staff is nice and helpful. I wish I could enjoyed it much more, but I appreciated my time there. Very good place and I would definitely stay there more. The desert tour is too expensive, and they don't offer good discounts. It is better to find the tour in the city - it is more than 200dhs difference! They gonna say the service is better, but the trip I did was very good. But the place and environment there are Amazing! I really appreciate the reception guys Yassine, Fahd, Said, and Loba! Very helpful, kind and lovely people. The location is good, however, as a girl, I was a little be afraid to go back to the hostel at night. There is only 2 bathroom for everyone to share and is always occupied and dirty. O valor é acessível, porém a taxa é extremamente cara. O ambiente é bom, porém não existe chaves nos quartos, todos tem acesso a todos os cômodos. A limpeza do local é simples, assim como o próprio hostel. O banheiro é super pequeno e a quantidade é pouca para o número de pessoas hospedadas. O quarto em que fiquei hospeda 14 pessoas e apenas 4 tomadas funcionavam. Em contraponto à isso, a equipe é simpática e ambiente é bem tranquilo. A localização é média, 15 min do grande centro.